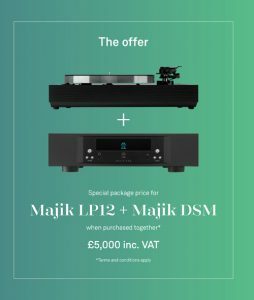 We are sprinkling a little more Majik this festive season with our Linn Majik LP12 + Linn Majik DSM package promotion. Discover high performance vinyl and streaming together for less and enjoy the best of both worlds. The warmth of vinyl. The clarity of studio quality digital. There’s no need to choose! This package includes everything you need to get started – just add speakers. The original Linn source- unmatched for over four decades. The LP12 is the pinnacle of record player design. Majik LP12 gives you the chance to own a true hi-fi icon. Providing everything you need to get started with high performance vinyl and with almost endless upgrade opportunity. Linn DSM took Linn’s ‘source first’ concept into the digital age. Majik DSM lets you take the first step into high performance streaming in studio quality and Linn’s unique Space Optimisation technology ensures the best possible sound in any room, optimised uniquely for you. 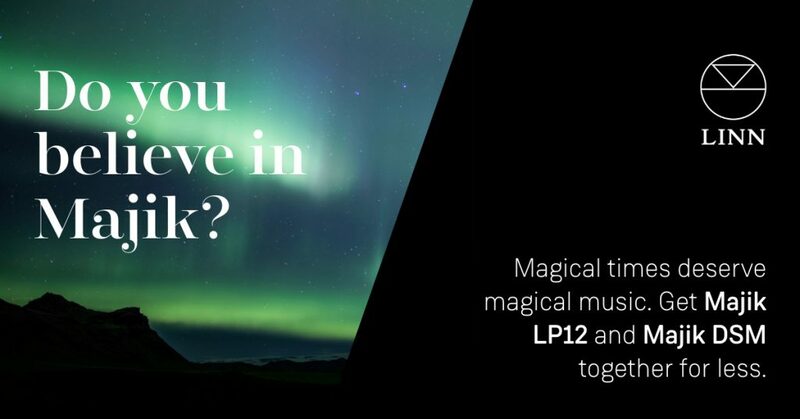 With its built-in phono stage, Majik LP12 can be connected directly alongside all other sources to make music sound better. Simply add speakers. Make an appointment with us for your personal demonstration.